When you’re channeling Annie Hall. She’s one of my favorite movie characters, because she loves life, laughs easily, and knows when to get out of a relationship with a selfish guy. I also love her wardrobe, the baggy trousers, and men’s hats and ties. I still adore Diane Keaton’s real-life style, and she and I are close in age. Today I channeled some Annie Hall with wide leg, drop-crotch trousers I think she would like. I found them in a small boutique in NYC, shopping with my glam friend Alida of My Makeover Mission. The paisley print blouse is from J Crew Factory. It’s supposed to button to the top with a dainty frill closure, but I chose to show some neckline. A v-neck really does make you look taller, if you want to be. The vintage cuff bracelet is from Citizen Rosebud’s shop (now on hiatus). Well-worn Dr. Martens boots. Love this “ON” crystal pin – also “NO” when you flip it. It was a gift from the lovely Catherine of Not Dressed as Lamb. Are you channeling any of your inspirations today? Show us in the link-up. Previous Article← Accessories: Are You A Maximalist Or A Minimalist? Hi! Fantastic! Great Look Annie Hall! You inspire me to that style.I would like to know more about your makeup. What kind of product do you use? please share. Usually, I just wear makeup in natural look which I use Korean product such a BB cream from https://www.womenangle.com/best-bb-cream-for-dry-skin/. This bb suits to my skin type. I really love your look. OH THAT PAISLEY!!!!! Be still my heart! Also loving the NO/ON pin. Clever! 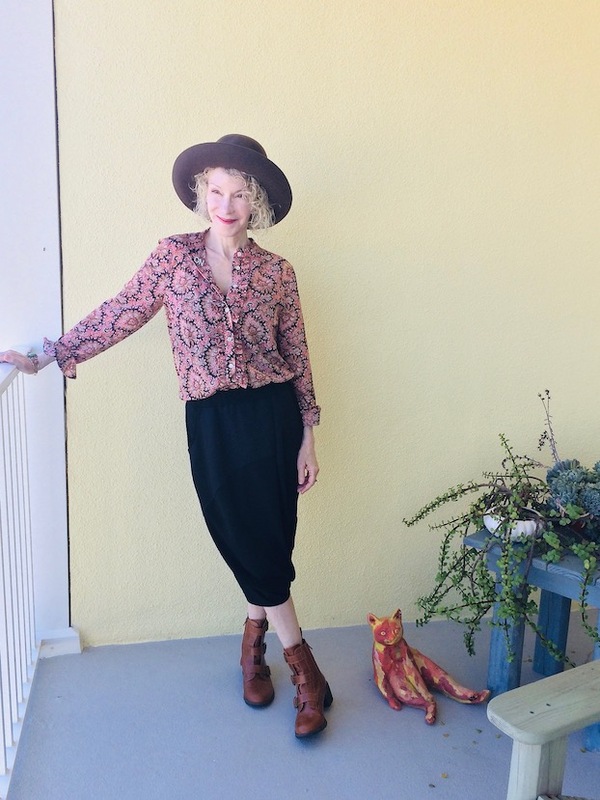 What a fabulous outfit, I love that blouse and you look so good in a hat. This is a very cool look for you – I love the hat! 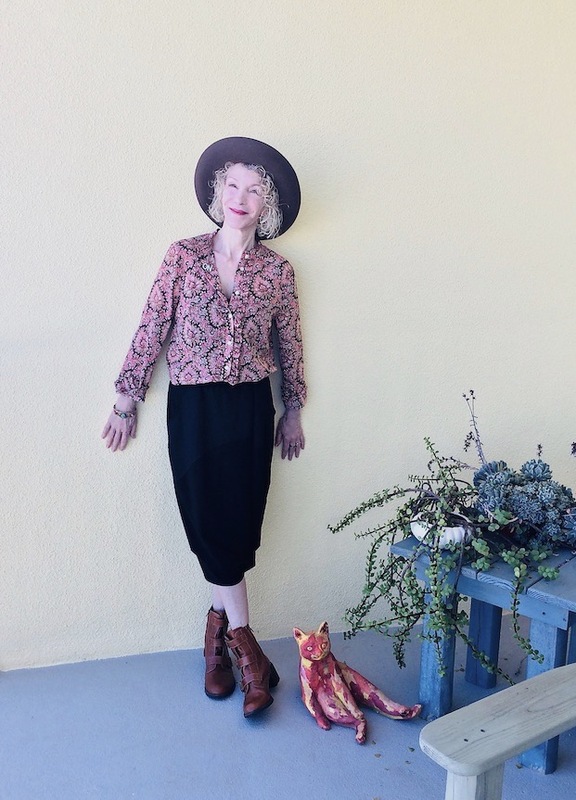 Yes, I follow Diane Keaton on IG and she has been posting several “Outfits of the Day”. I’ve always admired her style. I adore Annie Hall, and your style is fantastic, Patti! Love the spirit of it! Oh man, linkd in has gone gestapo. I had to sign in via google, but it was nasty. I don’t like that stuff as I’m not on any social media except blogger. Anyway, you do look super cool in your annie hall interpretation. And I luv the no-on pin. Love this look and the iconic Annie Hall! The paisley blouse is lovely and this look is ON point ! I love Annie Hall too—more for the fashion than for the story (Woody Allen is kind of gross)! It’s all about Diane Keaton! What a delightful pin and gift Catherine gave you! Diane Keaton is a style icon. The outfit is fun but it is your bright smile that really makes it. You look extra confident and happy here. Adore that hat on you! This is a darling outfit Patti and I love those booties too, I have a pair of Born booties tat are similar. Love the colors in that blouse on you too! You nailed the Annie Hall look — Diane Keaton is such a fashion icon. Adore her. Patti, I’m so delighted you are channeling Annie Hall. It was one of my favorite movies and I SO admire Diane Keaton. She is a woman who knows and has stuck with her unique style–very classy lady. You were able to meet up with Alida?? How wonderful is that!!! I saw Annie Hall only once, now you make me want to see it again. Especially since I’ve been loving hats so much lately. Love that top, so pretty. I always liked Diane Keaton too even though she’s a little older than me. Great outfit, Patty! I love Annie Hall and Diane Keaton is absolutely one of my favorite style icons of all time! I went to a ballet recently, and the audience was full of dance-enthusiastic French women, who are even more chic than your usual French women. One look I saw again and again, on all ages, was similar to the your photo: loose pants cuffed or rolled above low boots, with about two inches of leg (or wild socks) showing. Worn with low boots, especially Chelsea or Doc Marten-adjacent (though sometimes they are worn with athleisure shoes). The trousers almost always are pleated and loose (even baggy) at the top, and either cut straight down for a wide leg or tapered at the bottom. Lots of old man plaids, some pinstripes, and also solid black. I love Diane Keaton and you have definitely channeled Annie Hall here! You look totally cute! Love that blouse! I can’t seem to get the Cookie Disable button to work so can’t get to Visible Monday. Grr. I’ll keep trying. You really pinned that look down. Great outfit! The brooch is such a cute eyecatcher. Thanks for running the party. You wear that hat so well Patti and I love the pin! I love it when you channel Annie!!! thank you sweetie! You rock a great boho too, xox. Oh sorry! I don’t like that restriction either. I will complain to them. What a lovely look! I’m a fan of loose and drapey – those trousers are fabulous! Thanks so much for hosting, Patti! I’ll be joining you shortly! Your looks are always classy and classic. I love Diane Keaton to this day, especially for her way with those hats!